Nissan S Cargo's are such a loved Japenese vehicle that this Blog has been created for them. Whether your an admirer an owner you can get involved. Do you have S cargo story's, pictures, do you use it for your business, what ever you do let's try and create a collection register. Are you having trouble getting hold of spare parts, do you have spare parts for sale, this Blog could put you in touch. I'm just in the process of getting one going for a business which I'll reveal in a later post, but to give you a hint of what's to come, it's been in the garage for a lot longer than i ever imagined! But It'll come out in fine form and looking superb. Would you like to contribute?? Please send a post and I'll set you up. ..I am thinking of buying a SCARGO VAN from Japan...another friend of mine just did. What do you like about it? I am only 5 feet tall. I know the steering wheel does not tilt...will I be able to get close enough to pedals and see over the dash? And how is the power and speed on highways? Do you feel safe in it? ) I tried a smart car and did not feel safe.) Was it difficult learning to drive it with wheel on the right? The one I am looking at is automatic. It is $6000 USD. What do you think of that please? I am basically an idiot with cars but have a good mechanic. Just do not want to buy it and spend more fixing it. I plan to just drive it in and around Vancouver when I am there. thanks for replying soon or if anyone else can reply, also? I have just driven my s cargo for 14 hours through wind, rain and snow. She is worth it and I cant wait to get her cleaned up and wrapped in some great looking new clothes. Margo scargo is her name and she will be working for my new business. I will post some pictures when she gets dressed. Hi all - I have owned my S-Cargo for a little over a year and have found it to be a great fun. It never fails to draw smiles from everybody who sees it. I have, however, recently lost reverse gear and consequently it is not getting used as much as it should. Does anybody have any more specific info on the automatic transmission and which other Nissans use the same gearbox. >>the automatic transmission and which other Nissans use the same gearbox. In Japan, early 1990year or prior, Nissan Pulsar, Sunny(Centra in north america), Model which has E15 engine, FF cars. basically same trany. japan used car export company, located Osaka, JAPAN. and exports "Scargo" world widely, mainly Canada now. Hi, I am keen to purchase an s cargo here in New Zealand. Don't know anthing about them mechanically but just love them. Can anyone give me any advice or tips on what to look for when buying one, what is the main thing to go wrong, are they complicated and expensive to fix. I have an S-cargo for sale in excellent condition with all the extras and everything works. It is unlettered and has only done 36k miles from new and has been garage stored .It has a full MoT. I am in Cheshire UK. It needs to go to a good home where it will be cherished! 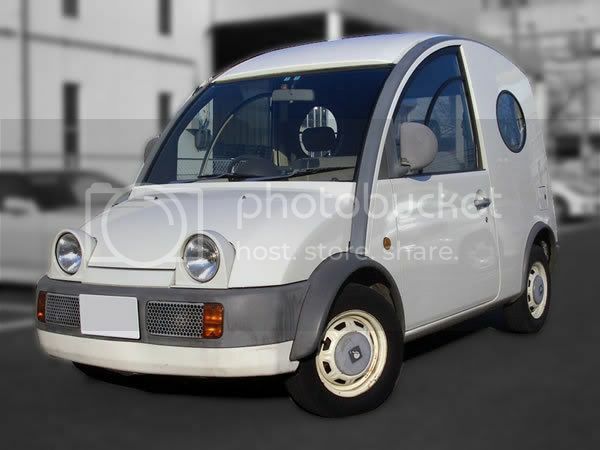 I have just bought an s-cargo, it is in mint condition except for the electric canvas roof which will not close completely. It looks as if the canvas has shrunk because the electric motor works fine. Even with the front closed the back appears to be some 30mm short and no matter how I try I cannot force it to close. Any suggestions would be welcome. Any idea on how to get a windscreen for my s-cargo? Hi, I'm in Sydney Australia, just bought my first SCargo, slightly damaged, needs wok to get it back on the road. Wondering if anyone else from Aust can give me a couple of contacts for parts and such. I wouldn't mind getting anther one or two from Japan, but am unsure as to who to contact there.Can anyone help?? I have noticed these type of special little cars don't just need a little attension but are reliable cars. Till you need a part for it! I have been chasing a part for 4 weeks. I need the key lock barrel for the back door. Any feedback regarding this part and other parts. FOR MANDM in NEW ZEALAND. Hi! I have a lovely little Snail (S-Cargo) which I will be looking to sell in April 2010. She runs like a dream. Are you still searching for one? I have recently bought a Nissan S cargo, but my windscreen has cracked. Any idea where I can get one from please? i have just bought an s cargo and cant find the spare tyre, the jack is attached to the the rear of the van behind the seats, How do you get it off, then which section of the car does it go under to jack it up? I love the car but its sure got its own mind about when it wants to start! I have had no luck with sorting my roof. It does not cause a problem other than kits a bit noisy when driving over 30mph. I did enquire with a boat builder/repair firm who are willing to make me a new one. They quoted me a figure of around £400 stirling. If you find an answer, let me know how you get on. I am pretty sure my car has some parts missing for the sunroof, does any one have photos or a schematic diagram I could look at. Also for any oneelse needing a new skin for the rag top are you interested in a group purchase and finally does anyone know of a sunroof in a breakers yard? I can't wait to get my S Cargo van on the road. Just waiting for the new super–duper paint job. HI EVERYONE, WE HAVE A LOVELY LITTLE SCARGO CALLED FIFI,HAD HER FOR ABOUT 8 YEARS NOW AND WOULDN'T PART WITH HER FOR ANYTHING, HOWEVER THE MILES ARE STARTING TO GET UP ON THE CLOCK AND SHE IS IN NEED OF SOME REPAIRS,PARTS ARE HARD TO COME BY SO IF ANYONE KNOWS OF ANYWHERE WE CAN GET SOME FROM WOULD GLADLY APPRECIATE IT. PARTSWORLD IN NEW ZEALAND HAVE SOME BUT UNFORTUNATELY NOT WHAT WE NEED. FRONT WINDSCREEN, STEERING RACK, MAIN METAL WATER PIPE FROM RADIATOR TO ENGINE. As far as I know the easiest way to get parts is to buy a second one for spares or so it seems. If you live in Australia, I heard Nissan motors in Rockdale has some parts but bare in mind they are not cheap. I was quoted about $180 Im sure that was full price imported and fitted! But Im sure if you gave Nissan in your particular country a call, you might get some parts. I heard these cars have a similar engine to a nissan pulsar. I understand that some of the engine parts are the same as those for both the nissan Sunny and the Micra, I havn't tested this out but it may be worth contacting a few scrap yards. This would not solve the windscreen problem but you may be able to get one made at a price! I recently had a complete stainless steel exhaust system made for less than £300 Sterling which was cheaper than an imported recycled one. Good luck and let us know how you get on. We were able to obtain the water pipes from Rockdale Nissan but unfortunately the steering rack is no longer available new, so sent the old one to Brisbane and had it repaired cost approx $450.00 still in need of a front windscreen, these are no longer available knew either, so if any one knows where I can get one would be greatly appreciated. You may need to talk with a glass manufacture. which is locked and I can't get in. Any suggestions? I bought my gorgeous s-cargo about 4 months ago unfortunately no owners manual in sight. I need to find out correct tyre pressures as am struggling... Can anyond help? Go to a tire shop.They should be able to help you. Have just brought a Nissan Scargo van. Anyone have an service manuals ... in English? are you still there? if you are, i'm looking to buy my second s-cargo. i live in victoria. do you know of any for sale in vancouver? Hi Is the van still available? Hi. I am thinking of buying an Escargo to transport my two rather large dogs but I need to know the load height - the height from ground to floor. Can anyone help? I think the running gear is Nissan Micra, and the engine is Nissan Sunny/Sentra. Nothing on e-bay but maybe try taking the part to a motorfactors and they can see if it matches to a micra? Another option is the S Cargo page on facebook called Nissan S-Cargo/Escargot Appreciation which has lots of helpful members. Good luck. There's a company called WILCO DIRECT which stock S Cargo parts maybe they can help. I have three S-Cargo here in the United States (East Coast). I am considerign selling one of these cars as I do not need three of them. I do not really know what prices they are worth atthe moment, so any advice on value would be appreciated. All of them are very nice examples which are in great condition, and which run and drive fine. They do not need anything at this time. All cool colors too. Our 1990 Nissan S Cargo was vandalised recently, front and back windows. Can anyone advise where we can get a replacement from? Restored and in everyday use. How does one contact you directly (email)? Is there a way to contact you through this blog other than posting here?